Hurricane Florence was a historic storm that dumped more than eight trillion gallons of water on North Carolina over a four-day period. It caused an estimated $22 billion in damage and claimed more than 40 lives in our state. The storm has impacted every major industry in our state, damaged homes and schools, and severely impacted roads, bridges and civic infrastructure. The storm’s record-shattering rainfalls dumped more than two feet of rain across a vast area, including several of our state’s largest hog producing counties. Many areas saw more than 30 inches of rain. The impact on hog farms was a relatively limited component of the more than $1.1 billion in damage and losses to the agricultural community. Our pig farmers were well prepared for the storm and came together in its wake to provide feed and fuel to those farms in need immediately following the storm. A summary follows. According to the NC Department of Environmental Quality, there were six farms with anaerobic treatment lagoons that suffered structural damage, eight farms that saw inundation of the lagoon with floodwaters, and 28 farms with lagoons that experienced overflows from the rainwater during the hurricane. The structural damage impacts ranged from breach in three instances to “cracks” in the dike wall or less significant structural impacts. More than 98% of North Carolina’s 3,300 active lagoons did not experience these significant issues. Hurricane Florence resulted in the loss of approximately 5,500 swine across the state. These losses were caused by a combination of wind damage, power outage and floodwaters and were distributed across an area larger than the state of Massachusetts. Farmers moved more than 20,000 pigs to higher ground before the storm and this coordinated effort across the industry unquestionably reduced animal mortality in our industry. In North Carolina, the stock of pigs and hogs is approximately 9 million animals. One of the lasting stories of Hurricane Florence involves the heroic actions of farmers, men and women who slept in the barn with their animals to ensure their safety, who delivered feed by the bucketful when automatic feed systems were knocked off-line, and who traveled by boat to check on their barns surrounded by floodwaters. 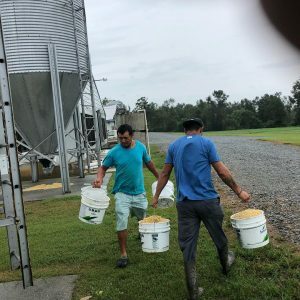 Farm workers in Sampson County feeding in immediate wake of storm. Our industry includes more than 2,100-plus farms. We support tens of thousands of jobs across a broad area, including at major processing facilities in Tar Heel, Clinton, Warsaw, Wilson, Kinston and in Mecklenburg County as well as grain processing facilities across eastern North Carolina. Our industry responded quickly to the storm’s impacts to ensure that employees could return to work, which is a key component of any economic recovery. Since Hurricane Floyd in 1999, the North Carolina pork industry has worked hard to protect farms from storms like Hurricane Florence. More than 325 hog lagoons located in the 100-year floodplain have been permanently closed in the past 20 years. The North Carolina Pork Council has supported a voluntary buyout of farms located in the 100-year floodplain and is pleased that Commissioner of Agriculture Steve Troxler and the NC Department of Agriculture have secured $5 million in state and federal funding to continue this program. It is estimated that about 60 hog farms are currently located in the 100-year floodplain, based on mapping reviews. When major storms hit North Carolina, many environmental groups immediately try to bring a focus to our treatment lagoons. But when floodwaters engulf entire communities, the impact is widespread, with most every aspect of our cities, counties and communities affected. According to FEMA, dams and levees were severely impacted in the storm, including at least 19 confirmed breaches in the Carolinas. Our industry shares in the deep concern for the significant losses across agriculture that were a result of this storm and that have threatened our our state’s ability to provide food, fiber and fuel. North Carolina’s pork industry is committed to responsible and ethical practices. Click this link to learn more about We Care. ← Florence update – Sept. 19 at 4 p.m.